Hawaii was the perfect place to holiday with my man. We had no plans other than to just soak up the sun, eat great food and explore the beauty of the island. 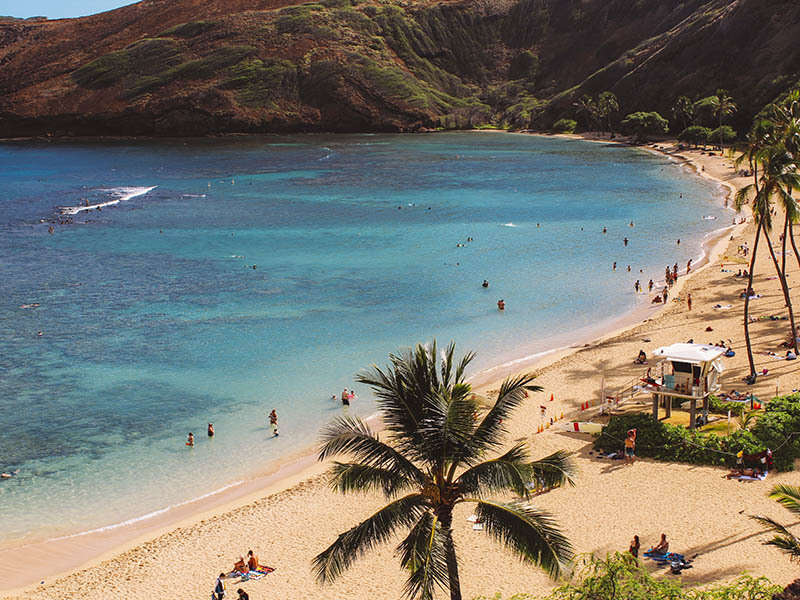 It was our first time in Oahu, we stayed 10 nights in total but could of stayed longer to explore the other islands. We ended up making friends with a local guy who took us to some incredible look outs and secret waterfalls with rope swings! We love our food and finding the right place to eat isn’t always easy. With Kayne always needing a decent size meal every time with enough protein to get him through every 3 hours and me, I just love a really tasty meal that is generally healthy. 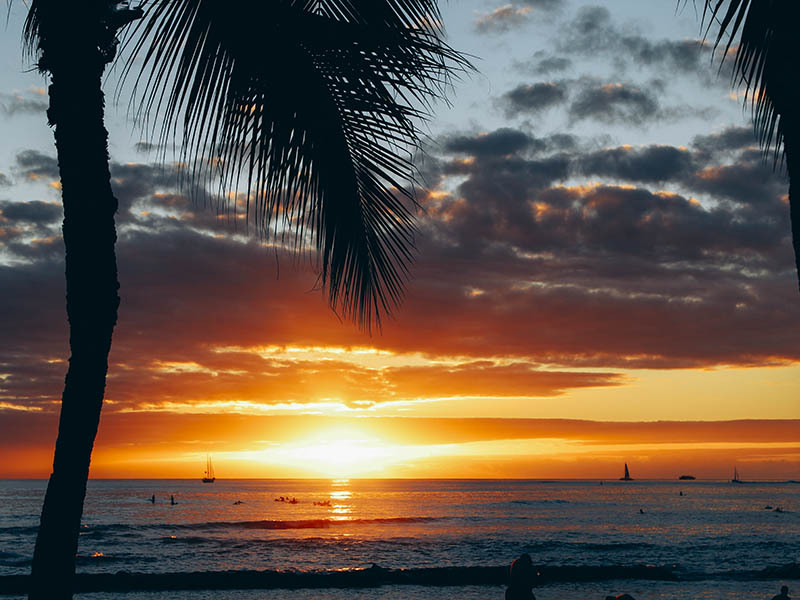 We quickly found that the meals in Hawaii are massive, always have a side of potatoes and smothered with cheese, so here are the places that weren’t heart stoppers. Island Vintage Coffee – The best Acai bowls I’ve ever eaten! Australia is terrible in comparison. Odoriko Japanese restaurant garlic scallops were to die for! 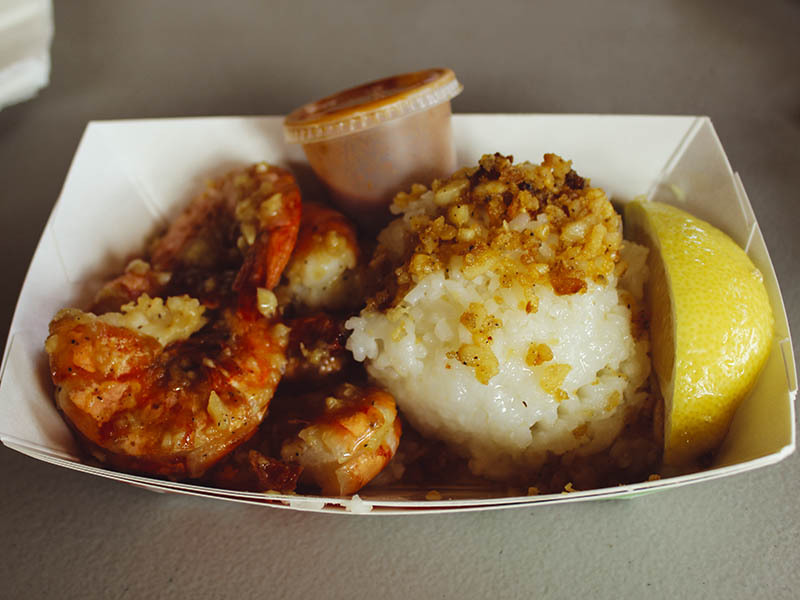 Giovanni’s shrimp shack were the best prawns we’ve ever eaten, tasted so fresh with so much flavour. Our local guy took us there, it’s a big white van covered in writing on the way to the north shore. Dukes has a great buffet breakfast, huge variety of foods and at a good price. Kayne gets his custom made omelettes of 6 eggs and no cheese (which was unheard of) and when I’m on holidays I love French toast and bacon with maple syrup! California Pizza Kitchen is a must if you’re a pizza lover! Kayne highly recommends the “Jamaican Jerk” with chilli flakes ( he’s a chill addict ). The revolving restaurant was a great place to go to watch the sunset and enjoy the two for one cocktails! Cha Cha Cha’s is your best bet for a Mexican dinner, be warned girls the meals are massive! Koko Head was honestly the hardest thing I’ve ever done, but it was so worth it! With 1049 stairs (not regular small stairs) it took me about 1.5 hours with very regular stops, no shade on the way up. Kayne being the fit athlete that he is raced ahead of me and climbed all the way to the top, then had to come half way down to help me , with a few times being my shade and motivation to keep going. I finally reached the top and was amazed at how high we had climbed, the views were just incredible, you could see over the whole south side of the island. Doing the climb as early in the morning as possible. Packing a large water in your backpack with some snacks. 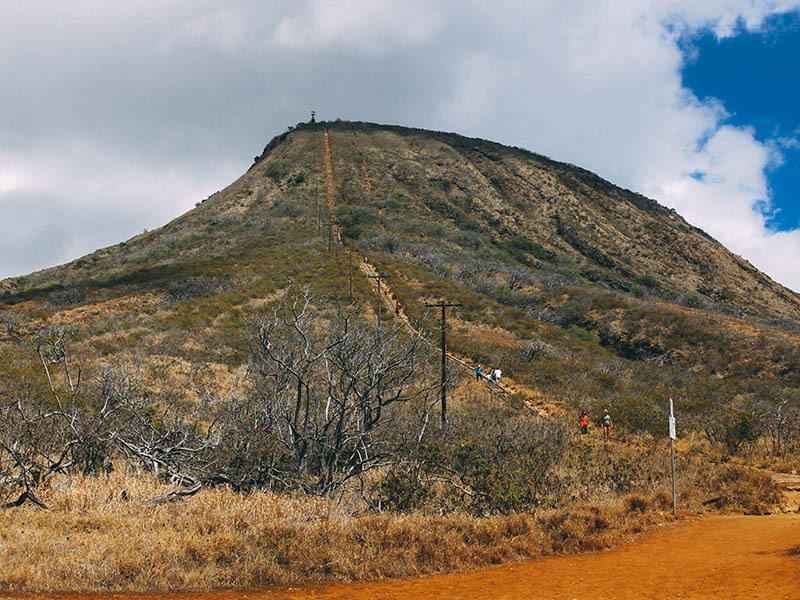 History : The rail tracks that lead up Koko head were used for transporting ammunition to the top of the mountain, protecting the island from air attacks during the war. The bunkers still remain, a lot of the history still remains intact. Much like the feeling of finding buried treasure, we discovered Hanauma Bay from the top of Koko head and immedietly knew we had to be there! 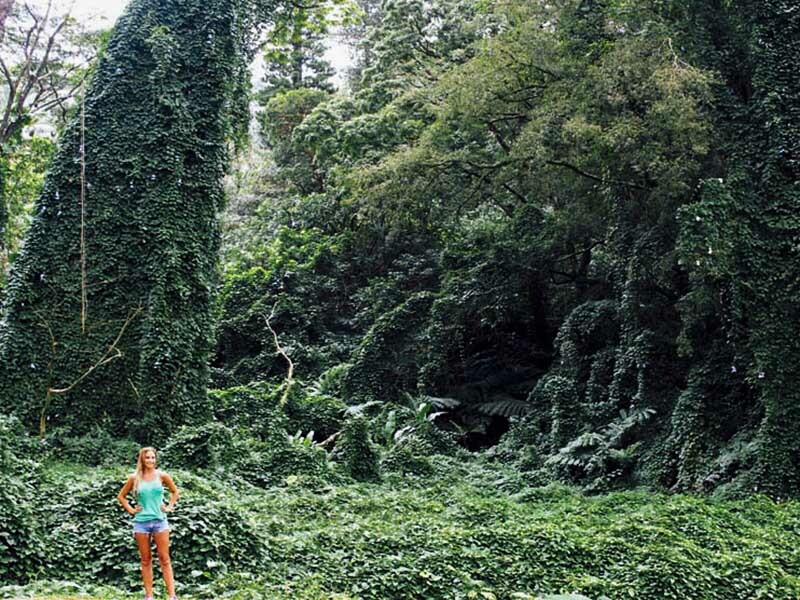 A sanctuary preserved by Hawaiians letting only a limited number of tourists in each time. Being up close and personal with turtles and rare fish was a truly breathtaking experience, the water was so warm and despite the number of tourist it still felt like a little piece of paradise that was untouched, something we will never forget. Take snacks and water as there is limited food available ( and expensive ). Pack a bag for the day, you will want to stay! If you love an adventure then monoa falls is a really beautiful hike, the rainforest was like avatar land and we even went swimming at the bottom of the waterfall. The hike only takes about half an hour, a restaurant is opened for lunch at the bottom of the hike. We hired a Jeep with our friends and had our local Hawaiian guy take us up to the North Shore. The drive was beautiful and so many places to stop on the way! The beaches were incredible, we ventured to the place where ” Forgetting Sarah Marshall” was filmed and jumped off the same rock. Na Hoku II is the ultimate booze boat that leaves out the front of the Outrigger on Waikiki Beach. $25 for all you can drink whilst cruising on sunset out on the water. They aren’t skimpy with the alcohol either!